Pickleballs. Arguably, no other topic generates such a passionate debate and angst amongst pickleball players than these 2.87” to 2.97” in diameter plastic balls that have between 26 and 40 circular holes. Well, perhaps aside from rally scoring. There are currently 21 USAPA/IFP approved tournament pickleballs from which the Tournament Director chooses when managing a USAPA-sanctioned event. For rec play and non-sanctioned tournaments, however, any ball can be used – regardless if the ball is, or is not, on the official list of approved balls. The pickleball selected for play in any USAPA- or IFP-sanctioned tournament must be named on the official list of approved balls. The approved balls on the list have met the official ball specifications dictated by the USAPA/IFP. Official ball specifications dictate acceptable parameters for the construction material, size, weight, bounce and hardness of the ball. A listing of the USAPA-approved balls can be found by clicking here. 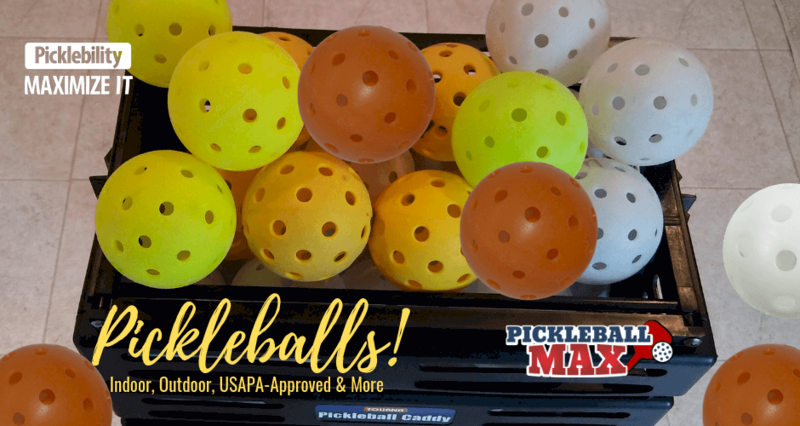 While each of the approved balls is approved for indoor and outdoor use, there are, nevertheless, significant differences in pickleballs when playing indoors versus outdoors. The pickleball newbie that unwittingly brings a hard, outdoor ball to use at an indoor facility – one with a wood floor – will likely be outed as being brand new to the sport even before swinging their paddle for the first time. If playing pickleball outdoors — or indoors on a tennis court surface — outdoor balls are typically used. The “outdoor” ball – because it is slightly heavier, harder and has smaller holes – travels significantly faster than the indoor ball. 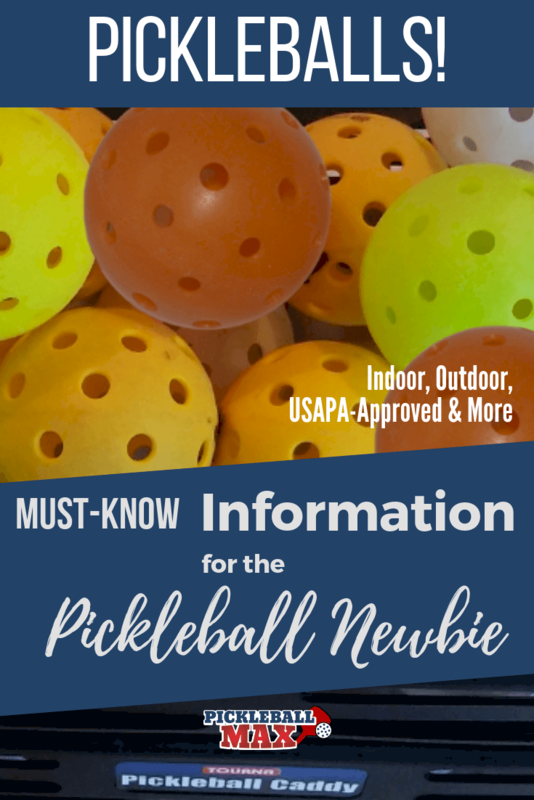 While there are several brands of USAPA-approved outdoor balls, the two leading brands are the Dura Fast 40 (Pickleball, Inc.) and the Fuse G2 Outdoor (Onix Sports). There are 40 holes, of varying sizes, in the Dura Fast 40 ball. While the Dura Fast 40 ball is generally the preferred ball for 4.5+ rated tournament players, it is also a ball much more susceptible to breakage in colder weather (especially when temperatures fall below 60 degrees). It’s not uncommon to break several balls during the course of a 2-3 hour session in these conditions. Because the Dura Fast 40 is often the “official” ball for top-tier tournaments (presumably because the “pro” players “favor” this ball), the more advanced players (those who are more apt to play tournaments) also put up with the breakage so that they can practice with the same ball that is most often used in these tournaments. These same players tend to rave about the ball’s playability, speed and overall performance — breakages withstanding. The Onix Fuse Outdoor ball is a ball that doesn’t break to the degree of the Dura Fast 40. It has 40 holes that are of all the same size. Because of the “excessive” breakage associated with the Dura Fast 40 (and economic implications), recreational players generally prefer this softer ball. Because the ball is softer, rallies tend to be longer with this ball as it is harder to put the ball away. The longer rallies make for fun play. While advanced and tournament players tend to favor the Dura Fast 40, the Onix Fuse is more likely to be the preferred outdoor ball for beginning pickleball players thru about 3.5 or 4.0 rated players. Of course, this is, admittedly, an over-generalization. If the Dura Fast 40 or the Onix Fuse pickleball isn’t in the cards for your individual purchase or for your club’s purchase, other popular outdoor USAPA-approved pickleball options include the Tour 40 (Engage), the X-40 (Franklin Sports, Inc.), the Monarch Outdoor and TOP (Pickleball Central). If playing indoors on a wood/composite gym floor — like at a local, recreation center — indoor balls are generally used. Using an outdoor #pickleball on a wood playing surface would result in significant skidding of the ball as it hits the floor – rendering the outdoor ball on this surface virtually unplayable. Indoor balls are lighter, softer and have larger (but generally fewer) holes than outdoor balls. Because of these characteristics, indoor balls come off the paddle a little “softer,” are easier to control and typically results in longer rallies. Jugs, the Photon Indoor (Gamma Sports) and Onix Fuse Indoor Balls are the most popular indoor pickleball brands. At our local community center, we use the Jugs #pickleball because of its favorable price point – although the ball does get soft and a bit squishy after prolonged use. As for color, there is not a single color that pleases everyone. The best color is going to depend on the color of the floor, the color of the background and the lighting characteristics of your venue. Why So Many Balls? Can’t there be Agreement on a Single One? With 21 different USAPA/IFP approved options, many wonder why the sport of pickleball cannot agree on a single ball. It would seemingly make life so much easier. This question seems legitimate – that is, until you contrast it with the sport of tennis and the number of tennis ball brands approved by the International Tennis Federation (ITF). To set the stage for the number of approved tennis balls, it’s important to understand that there are three main classes of tennis balls: Professional, Championship and Practice. There are also four categories of balls: Regular Duty balls, Extra Duty balls, Grass Court balls and Hi-Altitude Balls. Finally, tennis balls can be pressurized or pressure-less. In all, according to the International Tennis Federation website, there were approximately 12 pages of tennis ball brands approved in 2018. This makes 21 approved pickleballs seem quite tame, huh? I would love to hear your feedback on pickleballs in the comments below. Which pickleball — and color — do you prefer?